So, this was the second thing that Jess helped quite a bit with actually. Made for the Christmas morning tea thing at Compass. I actually really wanted to make a gingerbread house for Christmas, but unfortunately I just didn't have enough time to do that this year! 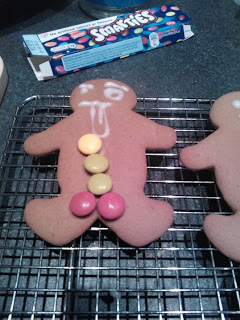 I thought the next best thing would be to make some gingerbread men. They were a little bit soft because I left them sitting on the bench all night by accident... Don't do that... But they still tasted amazing and had a bit of colour which was cool! I didn't bother making a royal icing because I didn't think they needed it, but you could if you wanted more control over the decoration and if you wanted to more than just a face and buttons. I have a recipe here. This recipe was from Exclusively Food. Sift flour, baking soda, mixed spice and ginger together in a medium bowl. Using an electric mixer or electric hand-held beaters, beat butter and brown sugar together in a large bowl. Stop the machine occasionally and use a spatula to scrape down the side and base of the bowl. Beat until the butter and sugar are well combined and the mixture is creamy. Add golden syrup/treacle and egg yolk to the butter mixture. Beat for about 30 seconds, until the ingredients are well combined. Using a spoon or the electric mixer/beaters on very low speed, incorporate the flour mixture into the butter mixture. Preheat oven to 180°C. Line a large baking tray with baking paper. Using your hands, bring the dough together into a ball. Divide the dough in half. Place one piece of dough between two large sheets of baking paper and roll out until 4-5mm thick. Leave dough between sheets of baking paper and place on a large flat tray or chopping board and put in the freezer for at least 15 minutes or in the refrigerator for at least 30 minutes. The dough will be very hard to work with if it is not thoroughly chilled. Repeat the rolling and chilling process with the second piece of dough. (It's not absolutely necessary to do this step, you can just start working the dough like I did, but it is very difficult because it's very soft. Still works though!) Once dough is cold and firm, remove from refrigerator or freezer, transfer to kitchen bench or leave on chopping board, and remove top sheet of baking paper. 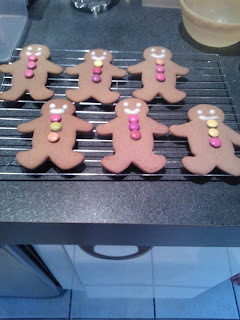 Working quickly, use a gingerbread man cutter to cut shapes from the dough. Transfer dough shapes to the lined baking tray, placing them about 2cm apart. As soon as the tray is filled, place it in the preheated oven. We recommend baking the biscuits one tray at a time. If you wish to bake more than one tray at a time, you will probably need to extend the baking time and may need to swap the positions of the trays halfway through for more even baking. Bake biscuits for about 10 minutes. 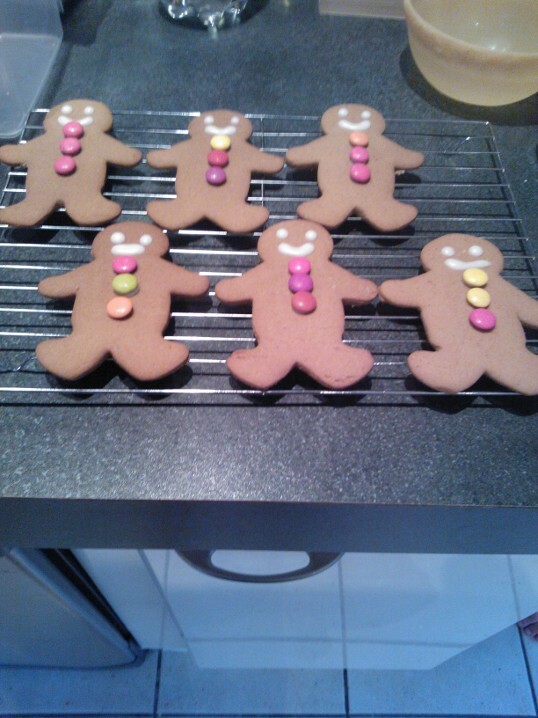 The longer the baking time, the crisper/harder the gingerbread will be. The biscuits will firm up as they cool. While biscuits are baking, form the dough offcuts into a disc and repeat the rolling and chilling process. Cool cooked biscuits on tray for five minutes before transferring to a wire rack to cool completely. When completely cool, frost as desired. You can add M&M's or Smarties as buttons like we did as well! All you have to do is mix as much icing sugar and hot (boiling) water together until you A) have enough to decorate all the cookies and B) the frosting is thick enough that it won't just slide off the cookies. Also you don't want it too thick so that it's not smooth. Just have a play! 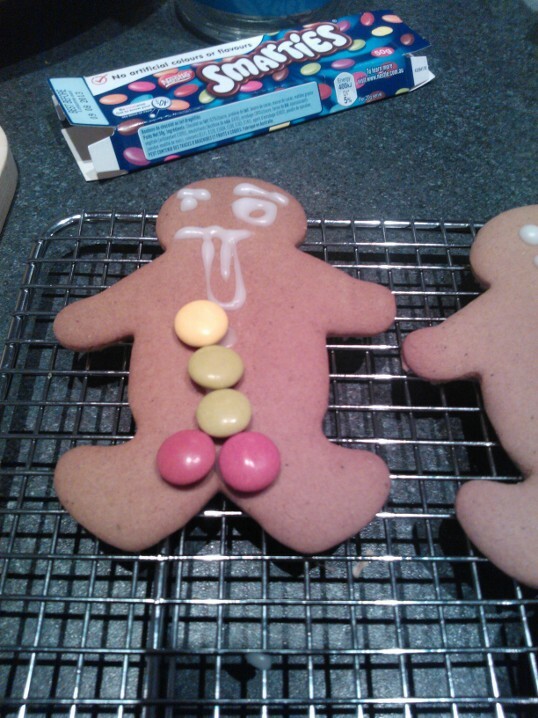 This is Drew's gingerbread man. You can see that I have very mature flatmates!